Having only seen most of Director Steven Soderbergh's more mainstream films and completely adoring his last one, "The Informant" I was happy to see him back on the grid and creating blockbusters with substance. 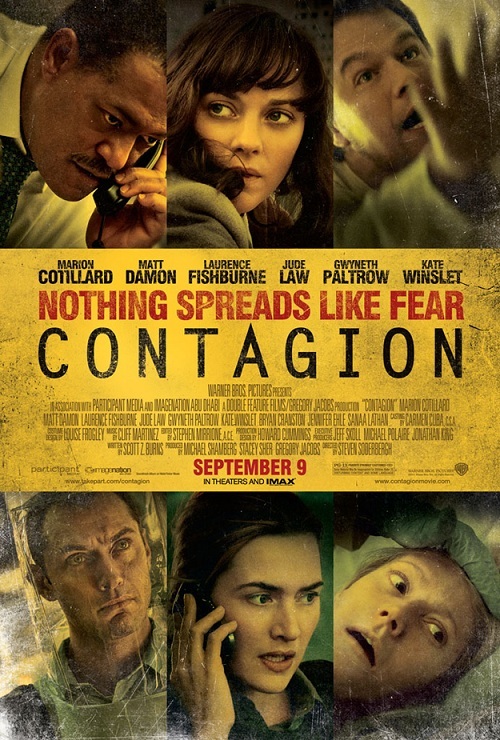 That is exactly what he has done here with "Contagion". 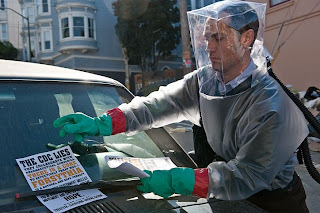 A film based around a rapidly spreading disease and the countless avenues with which it affects humanity is chronicled in a way that doesn't result to showing cities of mass hysteria and cliched shots of streets filled with the sick searching for a way out. Instead, it follows several story lines, giving a well rounded view of the epidemic while constantly feeling personal. Soderbergh hits the ground running from the opening sequence and never lets up. His pacing allows each storyline to unfold with a different take on the situation that contrasts the one just prior enough to the point that we never feel as if we know everything about what is going on either, or how deadly this disease might actually be. It is certainly a smart film, but it is one that operates in such a way that we are compelled to pay attention to the details because the frightening aspect of the film is that it is completely plausible. This is a solid film, and engaging thriller, but above anything it is a well made piece of entertainment that is also the most realistic of accounts were something like this to actually occur. killed his wife. Too bad the doctor doesn't know. We are only taken out of this reality with the appearance of so many familiar faces. 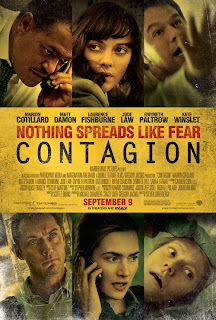 Soderbergh has enlisted many of today's top actors in his overlapping tale of how this airborne virus can take lives just as quick as you might realize you have contracted it. The story begins with Gwyneth Paltrow's Beth Emhoff as she returns from a trip to Hong Kong. She is the first clear case that results in death. She is quickly followed by others in which Soderbergh uses split screens that allow the narrative to effectively illustrate how quickly and how wide the disease can in fact travel. 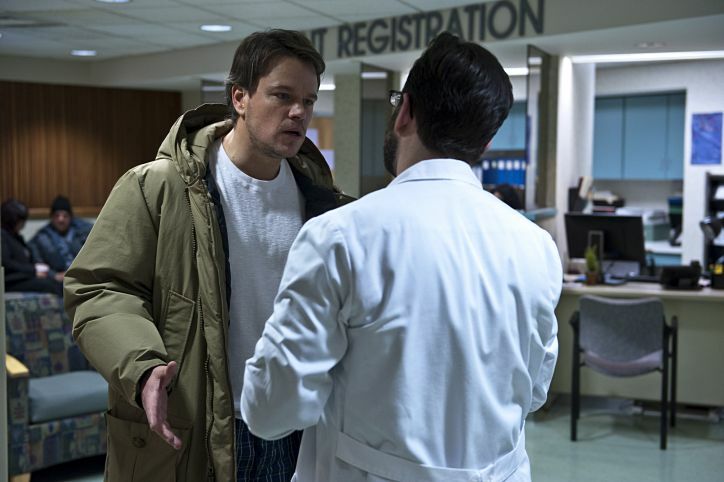 Matt Damon shows up as Beth's husband who seems to be immune to the disease. We also have Laurence Fishburne as Dr. Ellis Cheever, a major player at the center for disease control who heads the investigation that is looking to put a stop to the virus. He assigns Kate Winslet to Chicago were Emhoff resided to begin looking at where the disease could have originated. At the same time we have Marion Cotillard in Hong Kong looking for the same things. 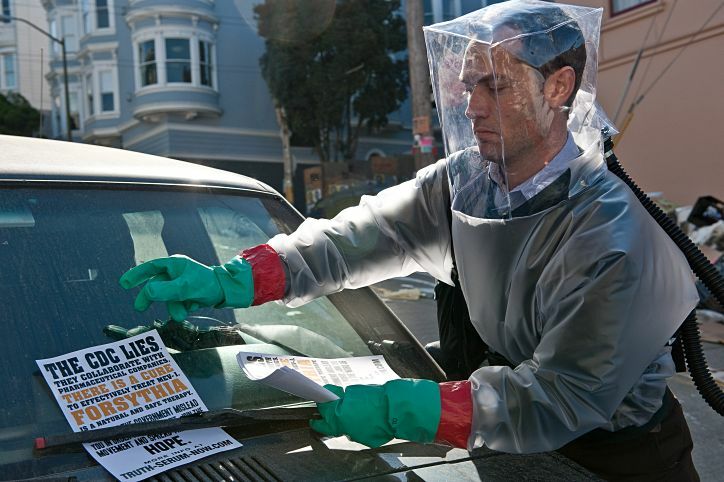 Jude Law is a blogger determined to undermine the big corporations of the world and deliver the truth about the disease and its cure to his loyal followers. Bryan Cranston and the impressive Jennifer Ehle show up in smaller roles, Ehle (who bears a striking resemblance to Meryl Streep) is especially effective here as a researcher who tests a possible cure on herself. In more interesting yet intriguing bits of casting both Demetri Martin and Elliott Gould show up in brief, but critical moments and even John Hawkes appears in a few scenes as a janitor at the CDC. Mears (Kate Winslet) discuss a quickly spreading. That may sound all too complicated in such a brief description, but rest assured that under the guiding hand of such a talented filmmaker as Soderbergh we are given a fully developed world that is immensely detailed. More than anything he gives us good reason to never touch a public surface again. It is with each tap, slide, or grasp of a handlebar or door knob, the peanuts at a bar, the hands of another that Soderbergh so closely zeroes in on that it brings the awareness of how easily his subject matter could easily become the pandemic it eventually does. He creates a sense of not fear, but almost panic in the audience that you will no doubt be giving ugly looks to those you hear coughing to close to you from now on. There is no other way to describe it than compelling, carefully crafted cinema. The single detraction of the film is the seemingly distanced relationships we establish with the characters. In the way that having multiple story lines allows us to see several points of view of a global issue it also takes away in some regard as we get to know a few of these characters rather well and sometimes wish for more time to be spent with them rather than leaving to give time to a lesser plot line. This is especially true in terms of Damon's Mitch Emhoff who finds purpose in his daughter from a previous marriage. His sense of immunity to the virus allows him the advantage of doing what is right and not only looking out for himself, but in looking out for his loved one he becomes our focal protagonist. Fishburne is also in fine form here and had it gone back and forth between his and Damon's characters I believe I would have been fine with that. Still, without the numerous plot threads it might not have been as consistent with holding its audience over pins and needles. efforts to find a cure for the disease. There are certainly the advantages and disadvantages of going either way with this, but Soderbergh no doubt weighed his options and this was clearly the more effective way to shoot the film, and I can trust that completely. 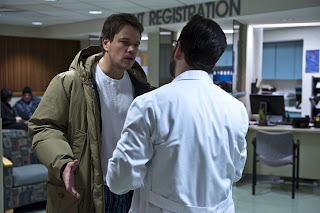 I've read that the screenplay was a collaboration between Scott Burns (The Bourne Ultimatum, The Informant) and several doctors with which he consulted. That the virus in the film is one based on some traits of the Nipah virus from Malaysia in the late 1990s which spread from pigs to farmers. If that doesn't add some credibility and real interest for you to seek out the film and give it a shot, I'm not sure what will. 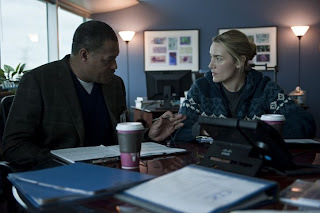 Being part thriller, part procedural drama as well as giving glimpses into the lives and emotional strain this causes on families and co workers, "Contagion" is no doubt one of the smartest blockbusters this year. It won't likely garner much Oscar talk, and never comes off as a film that was made for that purpose but I would think it smart for the Academy to take a closer look at films outside the average oscar bait genres, this certainly deserves the respect and earned the right with its tight screenplay, well acted ensemble and nearly flawless direction. Before the film, we were served a trailer featuring Soderbergh's next feature, "Haywire". Now having seen what he's done with the fast spreading epidemic premise, I can't wait to see what he does with the rogue CIA agent one.